The new venue showcase site provides a virtual tour of London conference centres including the Royal College of Physicians, Wellcome Collection and Central Hall Westminster. Haymarket Conferences head of content and development Alex Whitson commented: "we researched the market and asked buyers about their key purchasing criteria when selecting venues for conferences. Each of the venues on virtualvenuevisit.com has to respond to these questions during their videos - it isn't a goldfish bowl tour of the space." 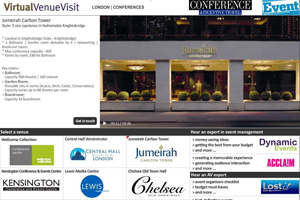 The next venue showcase on virtualvenuevisit.com will be unusual venues in London. Venues interested in taking part should contact alex.whitson@haymarket.com to confirm availability.